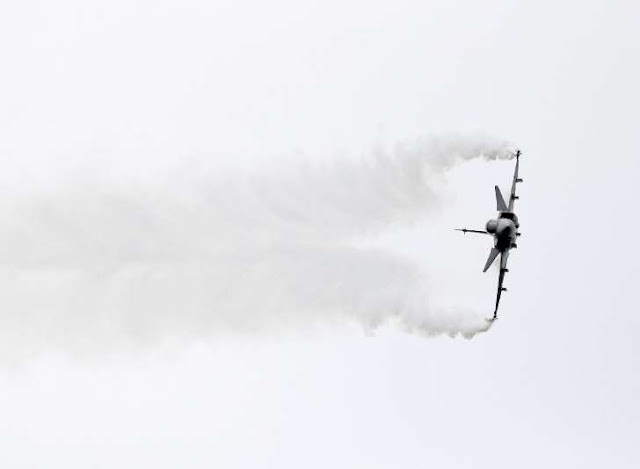 A Thai military air show for children was marred by tragedy on Saturday when a fighter jet plunged from the sky and burst into flames, killing the pilot. A Thai air force pilot has died when his fighter jet crashed at an air show during the country's Children's Day. Amateur video footage shows the JAS 39 Gripen jet maneuvering over the Hat Yai air base in southern Thailand when it suddenly lost altitude and crashed in a ball of fire away from spectators. The Ministry of Defense is investigating the cause of the crash on Saturday. Deputy government spokesman Werachon Sukondhapatipakerachon says Prime Minister Prayuth Chan-ocha expressed condolences to the pilot's family. Children's Day is usually observed with public outings at military bases. 0 Response to "Thai pilot killed when jet crashes during air show for kids"